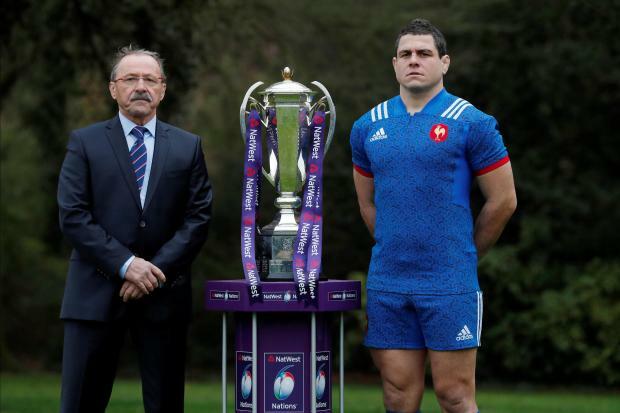 France head coach Jacques Brunel and Guilhem Guirado pose during the launch. Ireland face France in Paris on Saturday bidding to kick-start their NatWest 6 Nations campaign with an opening victory. Here, Press Association Sport examines the key talking points ahead of the Stade de France encounter. Lock James Ryan, wing Jacob Stockdale and centre Bundee Aki will all make their tournament debuts for Ireland in the unforgiving Stade de France atmosphere. Captain Rory Best has challenged the trio to step up to the plate and prove their true Test match credentials, in the bear-pit Paris arena. Amid the baying crowds and ferocious noise, Best wants the youngsters to keep their heads. How those three stand or fall could play a crucial part in Ireland's chances. Bordeaux Begles playmaker Matthieu Jalibert boasts just 15 appearances in France's Top 14 league. The uncapped 19-year-old has been thrust into Les Bleus' starting line-up nevertheless, given full backing by France's coaching staff. A livewire attacking operator, Jalibert can still expect to be put under huge pressure by Ireland's back-row unit. Former Italy coach Brunel has taken the helm with France after Guy Noves was sacked in December. Noves turned Toulouse into Europe's most successful club side, but that crown had slipped somewhat by the time he stepped up to the France gig. Les Bleus have struggled for some years and have not tasted Six Nations success since their 2010 title. Brunel is bidding to reverse those fortunes and has already made some bold selection calls. But the pressure is on right from the start. Ireland exuded a more attacking, more confident blueprint en route to three-straight victories in the November Test series. Head coach Joe Schmidt continues to insist Ireland have not expanded their game, but quite clearly their attacking style changed in the autumn. If scrum-half Conor Murray and fly-half Johnny Sexton pop up across the midfield again the way they did in November, then Ireland could well dominate not just this encounter, but perhaps the tournament itself. The French pack has long since proved a barometer of Les Bleus' health, confidence and ability. If their forwards' heads drop, it is a sure-fire sign the hosts are in trouble. That has happened all too often in recent years, and always leaves a backline stacked with talent entirely hamstrung, without any front-foot ball to exploit. When the French find their fire up front however, they are an entirely different proposition. If Ireland subdue their pack, they can expect the victory.